Once upon a time (not so long ago) Data Loss Prevention (DLP) was a feature in Exchange and Exchange Online and would only affect mail flow. 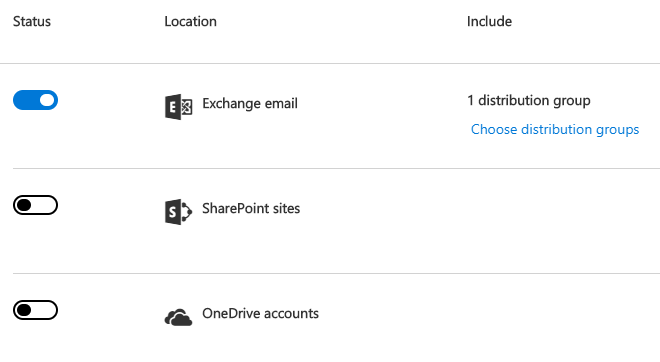 Nowadays the same technology has been transferred upwards one layer and is now part of Office 365 Security & Compliance center and deployable to Sharepoint Online and Onedrive as well. Deploying DLP does not require any additional licenses to your Office 365 Enterprise E3 / E5 – subscription. In this blog I will show you some experiences and examples on why and how to deploy DLP policies and what is the end user experience when DLP policies are deployed. 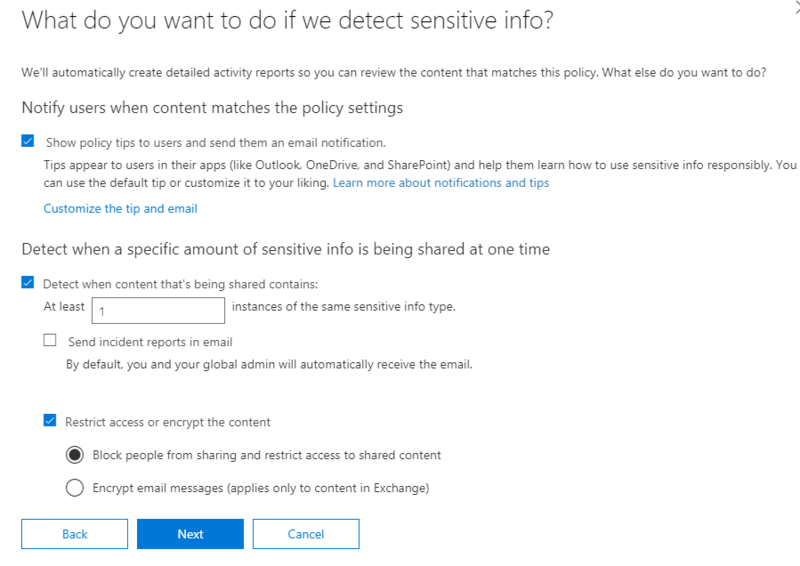 You probably have a written policy in place and your end users informed that you should not have any of these examples written in email messages let alone in email messages that are sent to external recipients. DLP policies can help you accomplishing this. DLP Policies can be targeted to distribution groups allowing you to do some experimenting and piloting before deploying organization-wide. More of this in “The How” section of this post. In this example we use Outlook for web, but similar experience comes with Outlook client as well. 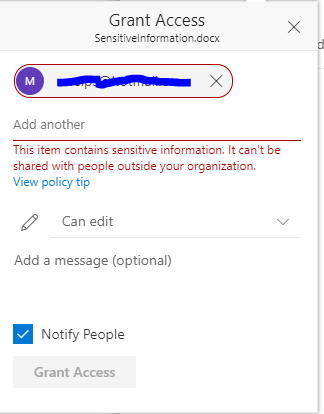 User is trying to send an email with sensitive information to external recipient and will receive Policy tip saying that you should not send this email. 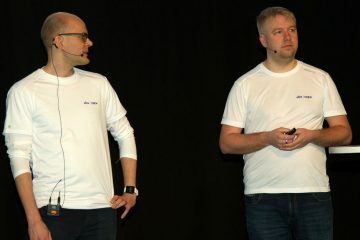 If the user ignores the message and sends the email without taking any additional actions they will receive information that the message was blocked. Outlook for Web shows this as a popup screen, Outlook client will send the information via email message. So the user is informed that they have chosen to do something that is not recommended and is against the company policy. After selecting “override” the user is then able to send the message. 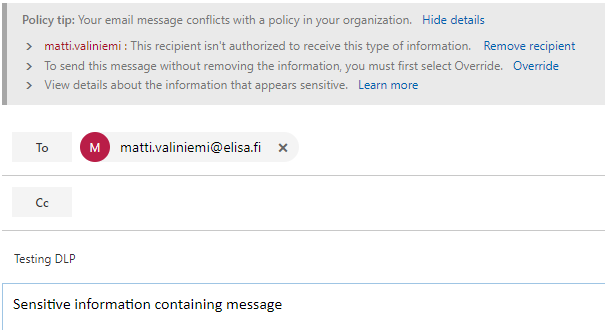 There are also possibilities to encrypt messages with Office 365 Message Encryption, but that is a topic for different post. Deploying DLP policies has been made easy and straightforward. 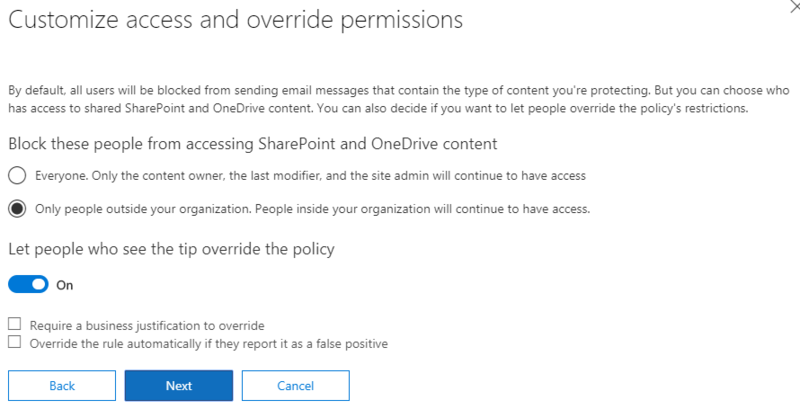 You will however need Global Admin or Compliance Administrator permissions for the Office 365 tenant in order to configure the policies. Compliance Administrator permission are granted in Security & Compliance admin center. Choose specific locations. This is very important because Exchange is the only location where you can target the policies per group. 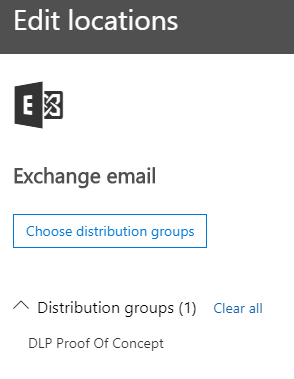 So if you dont want your policies to affect all users immediately you should choose Exchange as the only location and include only specific distribution group. Then we will configure the actions aka what to do if aforementioned content is detected. You can configure incident reports to be sent by email if you prefer, but these can also be obtained from Security & Compliance center and powershell. Then you will configure additional access permissions and override. I recommend letting users override the policy in the first phase so that you are not preventing anyone from doing his job. 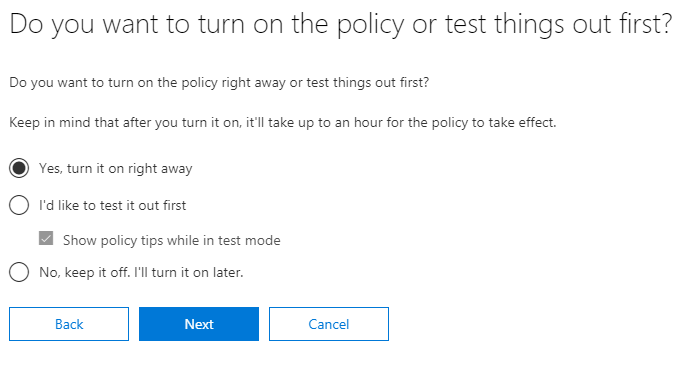 After configuring the policy you have the option to select whether or not you want to turn the policy on. 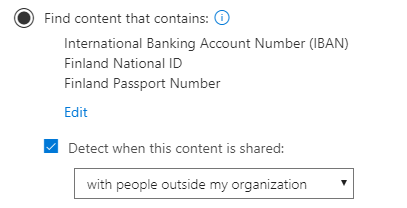 I recommend turning it on right away since you have targeted it to specific distribution group, but you can obviously select otherwise if you prefer. And that´s that. After you have completed the policy creation I recommend you check the settings and make sure that Low volume content and High volume content settings match and are configured accordingly. You can also customize policy tips that the users receive if you wish to. Also keep in mind that it can take some time before the policies are applied and users see the result. After you have done some experimenting and piloting of the feature you can then deploy it to all users. I recommend deploying to Exchange first and then see how it affects your end users everyday work. One thing that you should consider is the fact that override requires user action. This means that if you have an application or service that is sending email “as” users they will not be able to use override and if the messages contain sensitive information and are sent to external recipients they will be blocked. 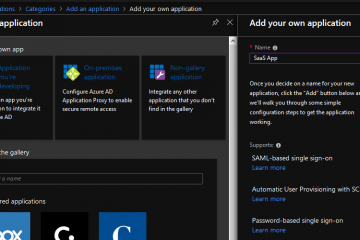 If you are interested in classifying data and messages and basing DLP policies on classification instead of content detection you should look into Azure Information Protection which is part of Enterprise Mobility & Security – packages. Highly skilled and hard working ICT Multi-talent working in highly skilled Elisa Consulting and Projects team. Specialized with Microsoft Certification in Office 365 deployments, Enterprise Mobility & Security (EMS) Exchange Server technologies and Operating System Deployment and Management (Windows 7, Windows 10). Working mainly in deployment / migration projects and sales support, but also familiar with all levels of continuous services and ITIL processes.